Some years before I was born, my mother used to work for a record company. She was employed as an accountant, but also did her fair share of backup-singing. As a direct result of her job, my parents had quite a large record collection – and I was introduced to many kinds of music from an early age. One record in particular was of great interest to me; the main reason for that was that the lady on the cover looked a lot like my mother. 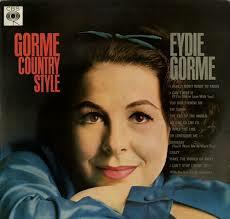 She wasn’t her, of course – she was the great Eydie Gorme! It used the same photo as her album “Eydie Swings The Blues“, only this EP was titled “Eydie Sings The Hits”. It contained four songs: “Love Me Forever”, “You Need Hands”, “Let Me Be Loved” and “Dormi, Dormi, Dormi”. That little 7 inch record was my introduction to La Gorme, and I have remained a faithful fan and great admirer ever since. That means my musical relationship with Eydie has lasted some 45 years. It also means, that when she passed away in August 2013, it felt a little like an old friend dying…. 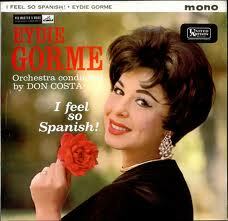 Eydie Gorme (1928 – 2013). No other singer could vocally do what she did. Truly one of the greatest…. 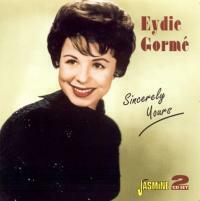 It has been stated dozens of times that even though she did most of her recording during the Rock’n’roll era, Eydie Gorme was one of the great traditional pop singers. I agree but in addition to recording wonderful versions of a lot of traditional pop songs, Eydie also recorded some very modern & up-to-date songs, she dabbled in country and songs from Broadway shows and movies – and she was a great interpreter of latin music and rhythms also. She’s left behind a great musical legacy, on some truly wonderful albums. I will deal with her solo records in this post; her records in tandem with hubby Steve Lawrence requires a post all its own (and the same goes for Steve’s records without Eydie!). The vocalist Gorme is in a class all by herself – she has a lot of all the trademarks of the classic, traditional pop vocalist: Timing, she never breathes audibly when she sings, a clear and precise enunciation, she can follow any tempo the band chooses and she makes everything she sings seem natural and unforced. The voice itself is very strong, and also very adaptable and flexible. Eydie can sing in a soft and warm tone, and her ballads always take on a kind of intimacy – like she’s singing to you only. But she can also add power, and let her voice rise and easily drive it up and over any orchestra and make herself be heard to the very backseat of any auditorium or stage. Yet she also makes this seem unforced, Eydie never screams or yells, even her most powerful and highest notes seem to just slip out equally easy. In her book “Rock-A-Bye-Baby“, Aida Pavletich deals with something she labels “the Stageshow quack”. Though it sounds pretty awful, it is actually used to describe the powerful voices of (traditional) female singers, who all have the kind of vocal power that can fill a large theatre with just the sound of their voice. Examples given are: Ethel Merman, Judy Garland, Liza Minnelli, Barbra Streisand, Barbara Cook and to a certain degree; Cleo Laine. I wouldn’t hesitate to also include Eydie in this category, though like all the others – her voice is unique and can never sound like (or be compared with) any of the others mentioned above. From 1956 on, Eydie released one great album after the other, starting with “Delight” (1956). She also devoted some of her albums to certain themes, like “Eydie Vamps The Roarings 20’s” (1958), “Eydie Swings The Blues” (1957), “Eydie In Dixieland” (1959) and “Gorme Sings Showstoppers” (1958). No matter what theme, Eydies voice was spot on, and proving she could handle any type of material equally well. Her other 1958 album, “Eydie In Love” shows off her softer side, and it it one of the most beautiful collection of love songs ever made. Her talent for involving herself in the lyrics clearly shows here, and the record never turns saccharine or syrupy. Maybe her recent marriage to Steve also helped her sound so convincing….? Any and all of her albums made between 1956 and 1960 are essential listening, and all of them stand as prime examples of “how-to-do-standards-very-well“. If ALL music from the 1950’s should be obliterated from the planet, except the very best – what would remain from that decade would be the albums of Frank Sinatra and those by Eydie Gorme! The 1960’s saw Eydie branch out and expand her talents into other kinds of Music. Her 1961 outing “I Feel So Spanish” has a very accurate title; on this album, Eydie removes any trace of her American singing self, and turns into fiery Spanish senorita – ay!! Being fluent in Spanish helps of course, but the way she sings gives away no clues that this singer was born in New York! During 1963 and 1964, Eydie made her two greatest, and still much-cherished pop hits; “Blame It On The Bossa Nova” and “I Want You To Meet My Baby”, reaching no 7 and 43 on the Hot 100 respectively. Both are classic girl group sounding pop confections of the 60’s – both show off another facet of the great Gorme voice, and both are musically miles away from anything she had recorded so far. Just to make sure she’d never get stuck in just one musical camp, 1964 also gave the world her first collaboration with The Trio Los Panchos, the album “Amor” as well as “Gorme Country Style“. The last one has been called the worst country album in history, which may be correct if you judge it by country standards. What the album is, is a great collection of country songs given a new, big band sheen – and re-dressing them as standards. On those terms, the album works very well indeed – and flows easily into Eydies long line of albums containing well-known songs performed by a great singer. The only difference is that these originate from around Nashville rather than Broadway or Tin Pan Alley…. At the 1967 Grammy Awards, Eydie was awarded the trophy for “Best Female Vocal Performance” for her recording of “If He Walked Into My Life” – and never has a winner been more deserving! The song (from the musical “Mame”) truly captures every nuance of what’s so great about Eydie. It was also a huge hit on the AC charts – reaching no 5. 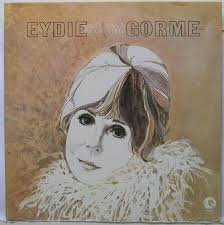 1969 once again saw Eydie in the Top Ten of the AC Charts. This time around, it was the title track from her album “Tonight I’ll Say A Prayer” that got to no 8. Her 1971 album “It Was A Good Time” was an all the way pop album, with her outstanding versions of “Going Back”, “Fire And Rain” and “Oh, No Not My Baby” being obvious highlights. 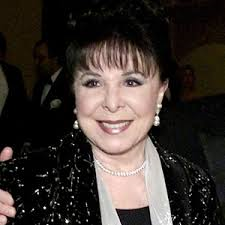 For the remaining 25 years of her recording career, Eydie did a little bit of everything: from covering Spains 1973 entry in the Eurovision Song Contest, “Eres Tu”, to light disco and a stunning version of Melissa Manchesters “Come In From The Rain” on her 1981 album “Since I Fell For You“. No matter what kind of material she chose, she was always great, and she kept her voice right through to the end. Eydie Gorme is one of the truly great voices of all time, and it is impossible not be to completely swept away when she is singing! Whether crooning a soft ballad, belting out a Broadway tune, catching fire in a big Spanish dramatic number or dancing along with “I Want You To Meet My Baby” – she is totally Eydie and that means the best there is! Oh, by the way: That little EP, “Eydie Sings The Hits” – I still have it! The cover is quite worn around the edges and the color has really faded, but the record itself still plays without scratches. Besides being a great record, it also stands as a tribute to my parents, who were wise enough to make sure their young son discovered the joys of music and great singers from an early age! Great article! Eydie had a wonderful voice. I’ve been inspired by Eydie as a singer myself. This is a great article. Thank you. 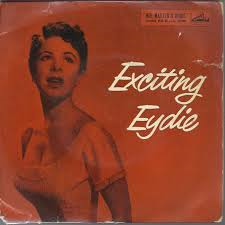 Glad you liked my article, and I am sure Eydie must have been a great inspiration to you, she is a singer quite a few notches above anyone else.